Amazon.com offers the AUTO-VOX M1 Backup Camera Kit Rear View Back Up Car Camera IP68 Waterproof Super Night Vision for $34.99 via coupon code VCY57ZMB . Features：With AUTO-VOX Rearview Backup Camera & Monitor Parking Reverse Assist System,you will now be able to easily park your car or automobile even in the tiniest parking spots, without risking damaging it and ruining your day or night. 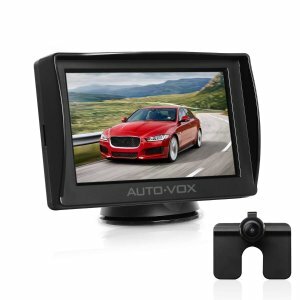 No More Complex Wiring Problem.AUTO-VOX 4.3” LCD rearview monitor connect a backup camera by one video cable, both the monitor & camera get power from 12V reversing light, no need to get power again for the monitor. With IP68 Standard Waterproof. NO worry about the fog or mist inside,the camera even works well at rainy day. This wide angle and low illumination camera gives a clear parking image, it performs well under the dark area with a little light.